Keep the 4th Saturday in Sept 2011 open for this great event. It’s growing like crazy and we’ll need your help. There were over 1,600 attendees this year and it made a nice chunk of money for the Earle Baum Center. Wow, it was a jaw dropping time for many of us. We thought it possible that our third annual event would be big but the reality of the crowd was dazzling. It was only possible by the hard work of so many of you. Petaluma Paddlers are more than an informal group of kayakers, it is an incredible community of special people. Thank you for sharing your time and energy for Earle Baum Center. You are the best. Everyone! We can survey the group to get a good idea of skill and interest levels. Then break out accordingly. The Paddle Float and the T-Rescue will be our main focus. They are the most reliable rescues. Once we have everyone on board with those we can move to the what if questions and the rescues that best suit the situation (The High Heel, Cleopatra’s Needle, use of the sling, All In, towing, the scramble, the Scoop, Reentry Roll). Water (there is no drinking water at chicken ranch), food, sunscreen, nose plugs, wetsuit or dry suit, foot wear, synthetic base layers, paddle float, bilge pump, sling, of course your boat with skirt and paddle. I find that if people eat before rescues, at the hottest point of the day, they are less likely to get fatigued. 2) Read up on the rescues so that if you have never done them you at least have a rough idea of what they are. 3) Bring a positive attitude. Let’s have fun. We will get some rescues and struggle with others. It’s ok if you don’t get them right away. No matter what your ability there are rescues out there for you. You might have to be the one to invent them, but I am sure you can do it! Google “Chicken Ranch Beach Inverness, CA.” Google map says that Chicken Ranch Beach is in Marshall, CA which maybe confusing because Marshall is on the eastern side of Tomales Bay (we will be on the western side). I’m pretty sure it’s Inverness. Maybe one of you locals can explain this. Parking is limited so please car pool if you can and park conservatively. There will be plenty of people to help with unloading boats. July 29th to August 11th Note that this is an excellent time to see the Perseid meteor shower, especially toward the end of this period. Ellen, Chocolate Larry and I saw them last year…..There was a light show in the water and in the sky, sensational. Aug 12th is the best night for the Perseids but there is a crescent moon setting at 9:30. Hmmm, it might be worth going that night anyway. Other things to note: We found a small night stick on the stern (Dollar Store) helpful to keep track of everyone. A flashlight or headlight is a must. I bring a small spare just in case. Apparently, someone got lost in the fog last year. They made it back but it was a bit freaky. Bring a compass or GPS. If it’s windy at the launch wait a while. The wind oftendissipates at sunset. I don’t recommend going out if there is wind. Don’t go alone. Bring your marine radio. Make sure you have good self-rescue skills, etc. This Saturday, July 24th is Petaluma’s first annual Rivertown Revival http://rivertownrevival.com/ featuring art boat races on the Petaluma River, amazing robots from Survival Research Laboratories http://www.srl.org/ and live music, food and drink at the River Heritage Center on the McNear peninsula. Parking is limited and the public is encouraged to arrive by alternative means of transport, including kayaks! Arrive at the Petaluma Marina by 11am and be on the water by 11:30am. There is no launch fee for kayaks but please unload on the fuel dock side of the ramp and keep the side by the Harbor Master’s office open for boat trailers. Petaluma is launching a first of its kind River Festival on July 24th, 2010. Called Rivertown Revival, this FREE and unique event embraces Petaluma’s Rivertown history with aquatic art, costumed characters and a wide variety of displays and activities, all presented in a turn of the century carnival atmosphere. Attendees are encouraged to join the fun by dressing in costumes reflecting the old-time “Rivertown” theme. The Rivertown Revival will run from 11:30 am to 6:00 pm and takes place near downtown Petaluma at the Petaluma River Heritage Center in Steamer Landing Park, 6 Copeland St. (off of D St.). This rustic park features the 100-year old Livery Stable, people often recognize as the Ghiradelli barn. The event will feature great Americana music, art boat drag races, live art, sideshows, children’s activities, food and beverage concessions, arts and craft vendors, and community non-profit displays. The Rivertown Revival is a fundraising event to benefit Friends of the Petaluma River and the Petaluma Arts Council. It is presented by Clementine Eco Events and sponsored by Lagunitas Brewing Company, Clover Organics, Outwest Garage, Heritage Salvage, and other local businesses and individuals who want to help celebrate and conserve the Petaluma River. Vendors include: Lagunita’s Brewing, Preferred Sonoma Caterers, Pizza Politana, the BBQ Brothers, The Fabulous Frickle Brothers, Petaluma Coffee and Tea Company, the Petaluma School of Ballet and many others. This event has been planned by an all -volunteer group of community members who envisioned a new kind of festival focusing on the River. For more information, including directions to the River Heritage Center, or to volunteer to help with this event, please visit: www.rivertownrevival.com or join our Facebook Page: Rivertown Revival or email: kelin@…. Download information and applications for boat entries and vendors on the Rivertown Revival website. Hearts Desire should be a mighty fine place to be this Sunday. For those interested, there an impressive patch of Western azalea (Rhododendron occidentale) that shouldn’t be missed. They are located back from Indian Beach on the fire road perhaps 200 yards from the beach on the uphill side of the road. The western azalea (I took the attached photo a couple of hours ago) is not only one of our prettiest native flowers, it also one of the most fragrant. First thing in the morning I can often smell the fowers before I see them. 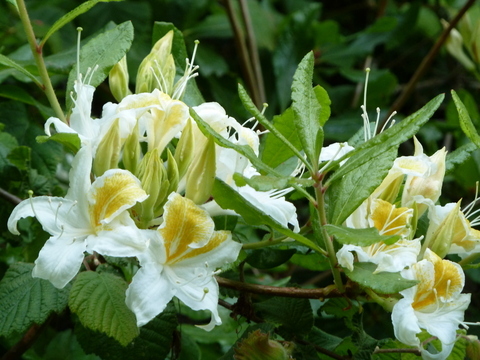 Joe says the best time for seeing the Western Azalea is just before Father's Day to just after July 4th. Join us at Foundry Wharf Sunday, June 6, for the fourth annual free Day on The River! Try rowing, outrigger canoeing, kayaking, stand-up paddling and more. This free event takes place at Petaluma’s Foundry Wharf, located at 2nd and H Streets, along the waterfront docks. Be our guest and try an eight-oared rowing shell, a six-person outrigger canoe, and other human-powered watercraft, including kayaks and traditional rowboats, as well as stand-up paddling and pedal boats (note: height and age restrictions may apply to the on-the-water activities). Dozens of volunteers from local clubs that practice these sports and activities year-round will be there to help anyone and everyone who wants to experience the thrill of small boats. For more information, contact Greg Sabourin (gjsabourin@aol.com) or Maggie Hohle (maggietext@comcast.net).